Market time once again. 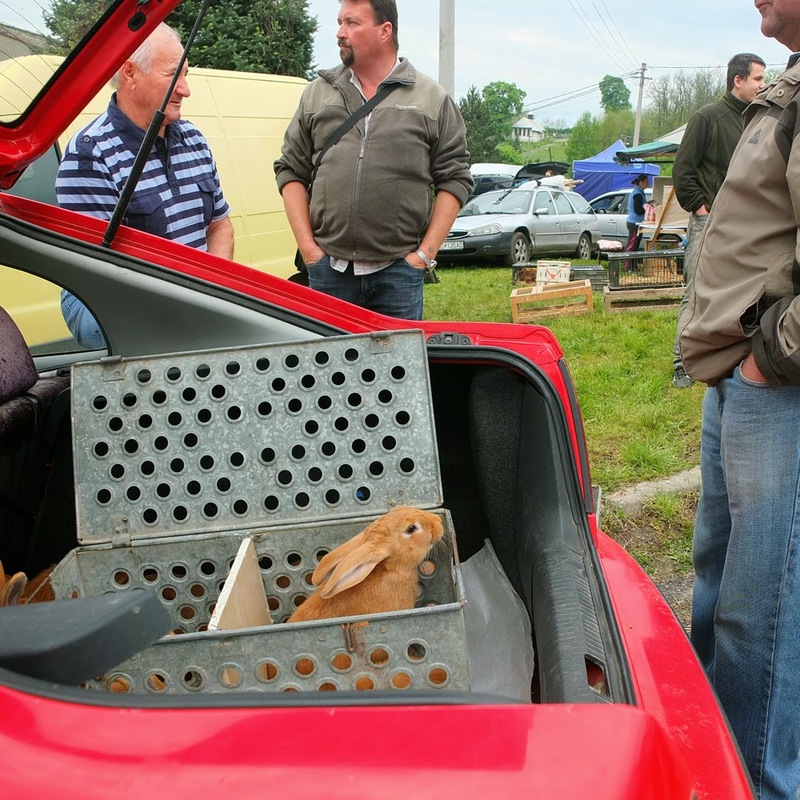 Despite hands in pockets, trade is brisk with farming animals up for grabs from the boots of cars. Bewildered rabbits, sheep, chickens, ducklings, pigs and goats are on display for the innocent onlooker to be persuaded by what they see in their eyes, "take me". But once again, like last year, we are not yet swayed to purchase any to increase the Havran Cottage animal community. At least not until next year, particularly now that we have a grandmother cat and two new kittens and mother residing in the old hen house. Where would the chickens go? After the rain and sun the grass grows rapidly once again but as the mower bruises through each blade more popping and heavy heaving engine noise can be heard until it wants to and finally give up. Having no engineering or repair skills this is a worry. Petrol and oil tanks have some left in, no problem there. Then I remember about the spark plug on the front, maybe that's it. I need to take it out to be able to go to a shop in the town to purchase a new one. New problem, no spanner to fit to take it out with. Our neighbour should have one, he has every tool, nevermind that they are all from a different generation ago. Unfortunately when he sees my mower he is very disappointed. Disappointed at me that is, for he knows how to look after his machinery. Because when a light stops working on his kettle he knows how to make it light up again. I am in envy but slightly embarrassed at my lack of knowledge. He cleans out two years of gunk in the air filter and sandpapers the spark plug after instantly having the right size spanner head to release it. I am hoping he won't turn the mower over to see how blunt the blades are. Too late, he knows I would not have sharpened them. More ammunition for him to growl and raise the blood vessels on his face. I was actually right about the spark plug, that was the issue with it not working. But I do know a little more about looking after a lawn mower now and should be able to cut effortlessly next week when all the good weather finally arrives. Or maybe we should have bought some sheep at the market instead.